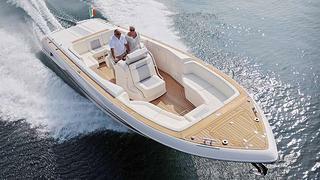 Italy’s Colombo yard has delivered the new 9.71m Super Indios tender to the owners of the 88m motor yacht Quattroelle. Designed by Nuvolari Lenard, her walkaround deck is fitted with comfortable sofas which can be fully protected by a Bimini top. Special items, such as retractable steps and ergonomic handles, have been specifically designed to facilitate the operations of embarking or disembarking. The 32’ Super Indios Tender is fully customisable, both in colours and engine options.